It's such a satisfying experience to finish your workout knowing you have created a calorie deficit. Many clients are trying to manage their weight and want to know "How many calories did I burn in this workout?" In order to answer this commonly asked question, it is important to understand the many factors that affect caloric consumption. This quick study will help you guide your clients to better exercise choices and help you better understand the "skinny" on measuring energy production and intensity, and the variables that affect caloric consumption. Define 17 terms related to the measurement of energy production. 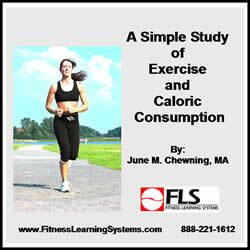 Discuss variables affecting caloric consumption during exercise. Describe how caloric consumption is measured. Discuss 4 ways intensity can be measured during exercise and the role of post exercise oxygen consumption. Discuss the role of exercise in overweight and obesity. Describe the variables that affect caloric consumption in the aquatic environment.